Although Barrie and North Bay delivered an awesome matchup in the Eastern Conference, one could see the second round of this year’s OHL playoffs as a bit of a disappointment. Okay, you probably could of assumed that the Oshawa and Peterborough series would have been pretty lopsided in the Generals favour, but I doubt anyone would have expected the two Western Conference quarterfinals would be done in rather short order. While the games in both series were close ones for the most part, the Erie Otters’ offence proved too much for the Soo Greyhounds too handle in its four game sweep, and the Guelph Storm’s depth was more than likely the key difference to knocking out the London Knights in five games. I highly doubt that the two conference finals will be short contests, but if they are, this year’s playoffs may end up being a rather disappointing one. Especially with the amount of hype going into it. Before I get to my predictions for the semis, here are my thoughts on the four teams that were knocked out in the second round. What I Predicted: If no big players are dealt, which seems like an annual occurrence with this team, a playoff spot is in the cards for the Petes come March. What Actually Happened: No one major was traded for once, and thanks to a dramatic come-from-behind series win over Kingston, the Petes advanced to the second round for the first time since they won the OHL title in 2006. What Lies Ahead: A possible home playoff seed in the Eastern Conference. They will lose overage defenders Nelson Armstrong and Clark Seymour, overage netminder Andrew D’Agostini, but pretty much everyone else will be coming back. What I Predicted: I don’t believe that the Colts will end up returning to the OHL finals this year, but I do think that this will be a side that gets better as the year goes on, and that Barrie will be a tough team for anyone to play against in the Eastern Conference playoffs. What Actually Happened: Pretty much that. The Colts had a chance to win the division and made short work of Sudbury in the first round. In fact, you can make a case that they might of had a chance to win the Eastern Conference title given its postseason showing. What Lies Ahead: A little bit of a regression. With a few graduating from the forward core, it might take a little bit for the younger guys to step up, and that process might also happen on the back end if Aaron Ekblad goes straight to the NHL. What I Predicted: I think the Greyhounds should hover around the battle for the sixth playoff spot this season, with a chance to earn a home playoff seed if the stars align. What Actually Happened: A team that I thought would be a major threat come next season arrive a year earlier that I expected. Not only did they earn that home playoff seed, but they won a division title for the first time since 2008. What Lies Ahead: With this year’s playoff experience in their record books, the Greyhounds might be the team to beat in the Western Conference come next season. Granted they do lose Matt Murray to the Pittsburgh Penguins organization and Darnell Nurse may be headed to Edmonton full-time, but this team will return a lot more than others. What I Predicted: This Knights team is once again a force to be reckoned with. 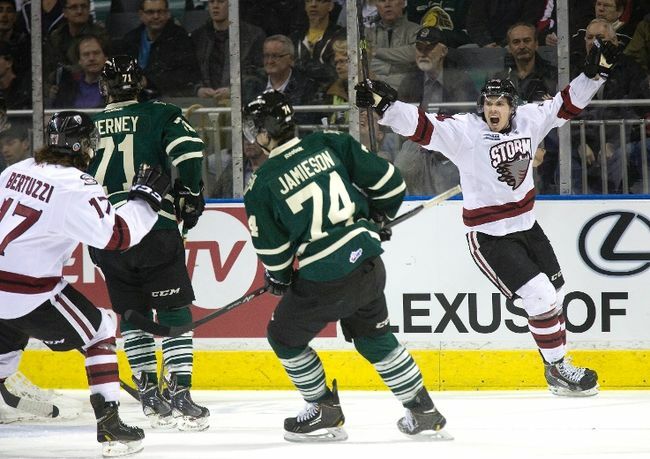 Even though they are already going to the Memorial Cup as the hosts, anything less will be viewed as a disappointment. What Actually Happened: The Knights did have a strong year, but their total of 103 points were not enough to even win its division. Perhaps it was their inconsistent form, the loss of Olli Mattaa to the NHL, Anthony Stolarz’s injury and playoff suspension, or a young defensive core. But no matter the reason, this year’s Knights team were unable to match the success of the past two squads. What Lies Ahead: First there is the Memorial Cup, where the Knights will have to get back into game-shape after having almost a month off. When it comes to next year, the team will be losing Stolarz, three overage defenders, and a number of drafted 94-born forwards. Plus, Max Domi, Bo Horvat, and Nikita Zadorov may all move on to the NHL. The window may finally be closing, for now at least. What do you mean North Bay isn’t rocking these uniforms all of the time? Well that’s a major disappointment, especially as we head into my Conference Finals predictions. 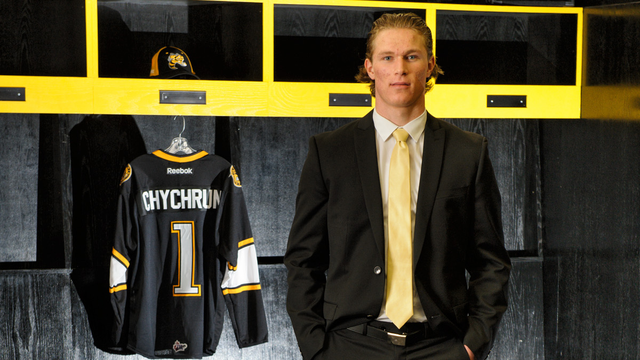 As I post this to the internet, the 2014 edition of the OHL Draft is just a few hours away from getting into full swing, with the Sarnia Sting having announced yesterday that highly-touted defender Jakob Chychrun would be the first overall selection in this year’s event. In this instant access world, everyone wants to have a quick opinion on what each of the 20 teams does on draft day, but it’s pretty much impossible. The vast majority of us have yet to see those drafted in person, and our lone glimpse may only come from a YouTube highlight reel. I have always been of the belief that you have to let at least five years pass before you make any final judgements on a draft, and with the 1993 birth-year players leaving the junior ranks, I figure this time is right to do my annual review of a previous OHL Draft by taking a look back at what happened in 2009. 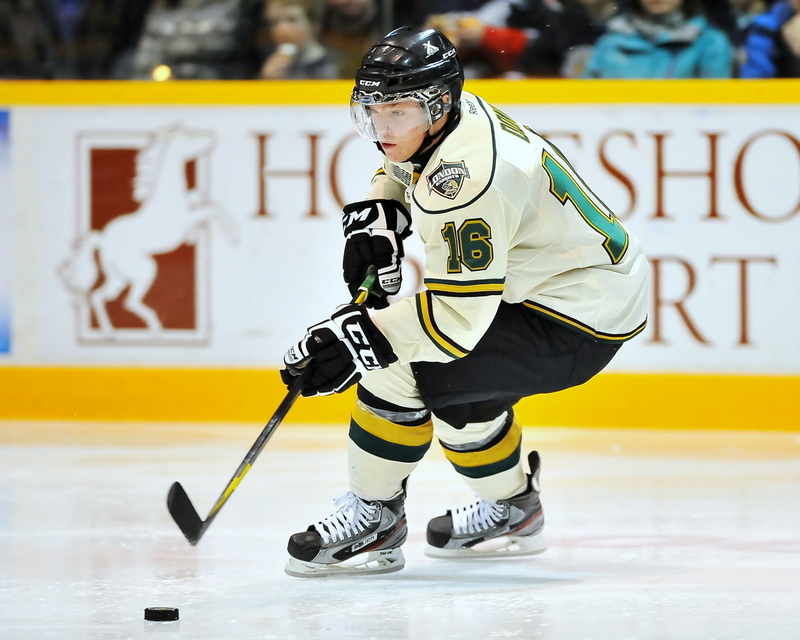 Ryan Strome ended up becoming a star in the league, though that was after he was traded to Niagara in a deal that saw the Colts pick up Alex Pietrangelo at the 2010 trade deadline. The Zach Hall pick ended up being good in the long run though, and Tyson Fawcett was a nice snag in the late stages of the draft. The Bulls did get a top-notch goalie in this draft, but it was in the 11th round and not with their first pick. Their next four picks were pretty solid as a whole after Teichmann though. This might be my favourite draft so far. All of the guys who stuck around in the OHL were solid players, and Spencer Abraham was a heck of a pick in the final round. While Erie’s draft isn’t that bad, most everyone that did something after they moved on from the Otters. That would certainly change in a few years time when that McJesus fellow came around. The Julian Ciocco pick aside, this draft is a pretty good one. You have a pair of players who are key cogs in this year’s OHL title hunt, and an 8th round pick who was one of the top netminders in the league. 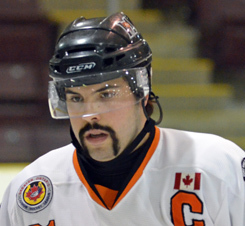 Also, take a look at Nik Passero’s wonderful stache. Oh Kingston. To be fair on this one, Palazeese thrived after he left town, Quine was dealt to get Ryan Spooner in a run during the 2010-11 season, Broek quit hockey after he was dealt to Belleville, and Morgan had concussion issues. Now this is a draft. Solid OHL players from top to bottom, a top-line defender (though you could argue how much defending he did while he was free-wheeling) with their top pick, and John Freaking Gibson in the 11th round. Perhaps they regret not having Dane Fox’s goals as an overager, but they got Greg McKegg for him so that’s not too bad. Scott Harrington became a leader at the back end, and for a fourth rounder, Seth Griffith was outstanding. Yeah there’s a lot of guys who didn’t do much, but when you get two top-line defenders in Percy and DeMelo, I don’t think you can be that upset about how your draft went. Since Lucas Lessio didn’t play for Niagara at all (he was traded to Oshawa where he would end up playing in the OHL), that sort of takes away from how things went. Though Dougie Hamilton made up for it by playing like a first round selection during his time in the OHL. Di Giuseppe would of been fun to watch in this league, whether it had been for Niagara or Windsor where he rights were dealt later on. The first few picks of this draft is pretty awesome. Everything else besides Hughes and McDowell, not so much. This reminds me a lot of the Brampton draft from earlier, with top notch OHL players all over the place, and a pair of players who are in NHL systems. Not sure about that Aaron Taylor pick though. Well besides that Tyler Morgan pick in the second round, this draft was another solid one. Also, what the heck is the Cochrane Generals team that I get cover out here doing in this draft look-back? I’ve waited for a heroic cross-sport athlete to show up, and we got one in a Ohio State lacrosse player. As per usual for the Petes at this point, this wasn’t the best of drafts, especially since their top pick in Puempel would end up being traded to Kitchener. The Plymouth Whalers had a good draft in its first few picks? I’m flabbergasted. On a side-note, I would have loved to see what Kuraly would have done with some of the teams the Whalers had over the last couple of years. Well before this year’s eight place finishers. Loyola Marymount has a hockey team? Colour me impressed. Although Schiefele was dealt to Barrie before the start of the 2010-11 season for Mavric Parks, this draft was pretty good one. Plus, since Trocheck once won me five bucks in a NHL Draft bet, he always has a soft spot in my heart. Two quick notes here. Firstly, I need to book Craig Hottot’s band. Secondly, there’s a hockey program at ECU? As for the draft, it’s not really all that hot after the Brett Ritchie pick, until you get to the final two players. This is what having Alex Galchenyuk and Nail Yakupov on your team can do for you. Good old Patrick Volpe. As for this draft, Cat and Cousins were two really great picks, even if Catenacci was dealt to Owen Sound later on. Plus, here’s a friendly reminder that the draft pick that was used to pick up Ryan Sproul originally came from Barrie for Behn Robertson. Thanks again Colts brass. Two solid defenders to get things started, and an excellent late developing scoring threat in the 11th round? That’s a not bad day at the office. A college baseball player? I love this draft already. Eric Locke, even though he was dealt, is an awesome 13th round pick, and while many of the other players were traded away, they were used to help the team pick up other players during their run as an elite team in the OHL. On a side note, if they were able to get a couple of those college players, the Spitfires would have been lethal after Ellis and Hall left. And of course, we can’t wrap up our 2009 retrospective without taking a look at the CHL import draft. Boy I would have loved to have seen Tatar in the OHL. Also, look at those fun goalies that came to the CHL, heaven forbid we stop that from happening. Thanks a lot again for that stupid import goalie ban David Branch. 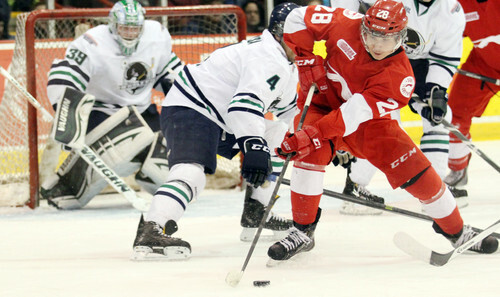 As ever, the opening round of the OHL playoffs was a tale of two conferences. (What a terrible way to start this blog post off I know). The proceedings Western Conference was pretty straight forward, minus London Knights goalie Anthony Stolarz channelling his inner Ron Hextall and a bit of a test for the Erie Otters from the Saginaw Spirit. However, the first round in the Eastern Conference ended up being really interesting. For starters, the Mississauga Steelheads took the top-ranked Oshawa Generals to three overtime games, and the Barrie Colts took the Sudbury Wolves behind the woodshed in a series that I thought would be a lot closer. Then we had two game seven’s. After trailing by a 3-1 margin, the North Bay Battalion roared back to life and defeated the Niagara Ice Dogs by a score of 2-1, thanks in large part to an impressive third period showing on home ice. 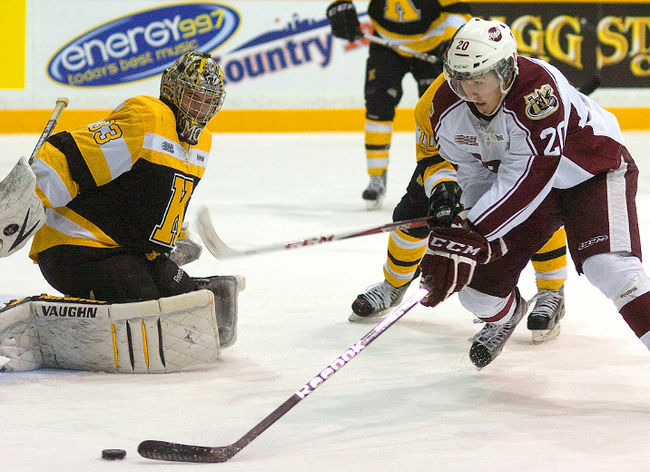 But the biggest story was in Kingston, where Nick Ritchie’s overtime goal gave Peterborough the series victory over the Frontenacs, and made the Petes only the fourth team in league history to come back from a 3-0 series deficit. The collapse by the Frontenacs means that they still haven’t won a playoff series since 1998, and it is far away the most shocking development from the first round of the post-season. So before we look ahead to the second round of the playoffs, let’s bid a fond farewell to the eight teams who have seen their season come to a conclusion. 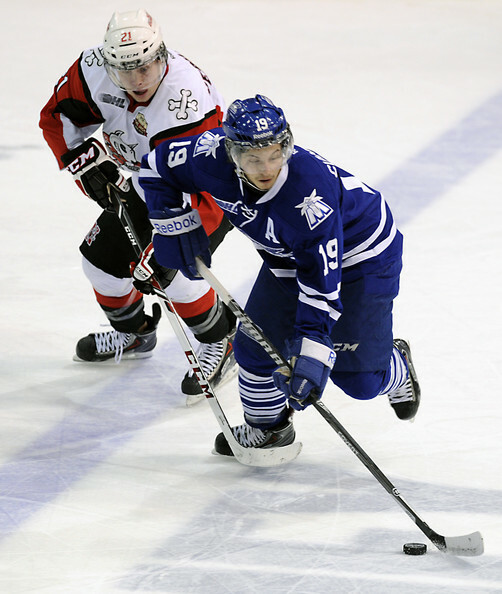 What I Predicted: While I’m having a hard time seeing them making the playoffs this year, I will not be surprised if the Steelheads are right in the mix in the Eastern Conference in a couple more seasons. What Actually Happened: Once again, the Steelheads snuck into the post-season and gave the top team in the conference a run for their money. Sunrise, sunset. What Lies Ahead: I might actually have the Steelheads as a sure-fire playoff team come next season. The entire defence is pretty much returning, and they actually have a possible high-point producer in Bryson Cianfrone. However, they will probably need a big season from Spencer Martin in goal in order to do that. What I Predicted: At the moment, I have the Ice Dogs missing the playoffs, but they might prove me wrong if the young players and the goaltending do well. What Actually Happened: Although Chris Festarini left the team around the deadline, Brent Moran was alright in a bigger role, and Brendan Perlini had a break-out campaign to lead the younger scorers into the post-season. They just about pulled off a huge upset over North Bay, but it wasn’t to be. What Lies Ahead: With a ton of 1996 born players on the roster, the Ice Dogs should be in the mix for a home playoff seed in its first year in their brand new arena (the Meridian Centre) in St. Catharines. It’s a little bit early to know exactly how the offence will be, but with Perlini and Toronto Maple Leafs prospect Carter Verhaeghe leading the way, they might be the best one-two punch in the Eastern Conference if it all plays out right. What I Predicted: If the Whalers can answer the questions around it’s new additions, this is a team that will not only be in the hunt for a home seed come playoff time, but they could find themselves once again facing London for a spot in the OHL finals. What Actually Happened: Well obviously not that. They continued their playoff streak for yet another season, but losing a ton of guys from last season’s Western Conference finalists and bringing in a ton of new faces took a lot longer to mesh than I expected. What Lies Ahead: It’s the Plymouth Whalers. Do you really think they will have another off year? Both goalies will be back, and the only big name that they will lose to the pro ranks will be Ryan Hartman. Also keep an eye on US NTDP forwards Sonny Milano and Jordan Greenway, who I wouldn’t be surprised to see in the OHL for the 2014/15 campaign. What I Predicted: I see the Attack fighting it out in that third to fifth range as the season winds down, but if the question mark in goal answers itself early, this is a side that might be a sleeper pick in the Western Conference. What Actually Happened: Brandon Hope and QMJHL waiver pick up Jack Flynn weren’t bad in goal, and the squad was pretty solid, but being in the same division as Erie, Guelph, and London didn’t help matters any. What Lies Ahead: Since the Attack will only lost their three overage player to graduation (the most notable being Kurtis Gabriel), this team should be contender to earn home ice advantage for the 2015 playoffs. Once again though, it will be interesting to see if Flynn and Hope will be the netminding duo once the season starts. What I Predicted: It might take a little bit for the Spirit’s blue line to get up to speed with everyone else. If they are able to do that, the Spirit should not only win their division, but also provide the Knights with a challenge in the postseason. What Actually Happened: My faith in the Spirit was a bit off. Jake Paterson, while solid yet again, wasn’t the world beater that I though he would be in his final OHL season. 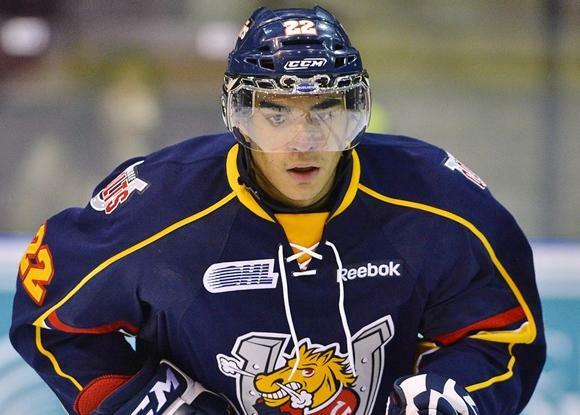 They made a big move at the deadline on defence to add Jesse Graham, but they still found themselves up against the high-flying Erie Otters. 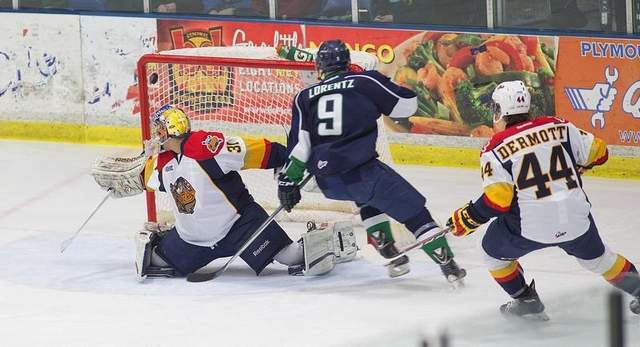 They pushed the Otters to three overtime games though, and played very well given the fact that it was just days after the passing of Spirit forward Terry Trafford. What Lies Ahead: It’s kind of hard to say at this point, the Spirit lose quite a bit when it comes to graduates, but they do have some solid pieces up front coming back in Jimmy Lodge, Nick Moutrey, Dylan Sadowy, and Blake Clarke. Whether or not those players will be used as trade bait to fix up the back-end for the future, remains to be seen. What I Predicted: If everything goes to plan, and the Wolves forwards are as good as they look, Sudbury has their best chance to make some noise in the post-season since their run to the league finals in 2007. What Actually Happened: A pretty disappointing campaign to say the least. Sudbury looked to have a division title in it’s grasp around the deadline, and even loaded up a little bit by getting Trevor Carrick on defence and forward Radek Faksa. Instead, things went south late, as they lost home ice advantage and ended up being shoved aside by Barrie. What Lies Ahead: A pretty interesting summer. The defence will be younger next year, and Troy Timpano might take the full starting load in his second year, even though a nice Import goalie draft pick would help a lot with that if it was still allowed (Thanks a lot David Branch). The biggest question mark will be up front, as the team has five forwards who will be overage candidates. 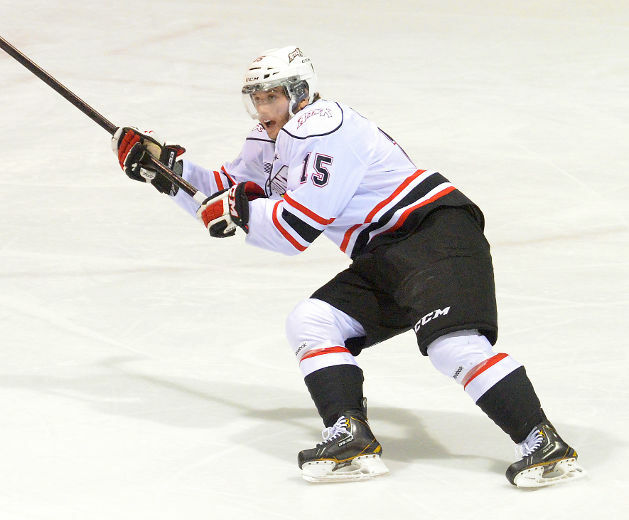 What I Predicted: If Jordan DeKort does well, the Spitfires could be in the mix for a home seed come March. But if things go South, this team could be scratching and clawing just to get into the dance. What Actually Happened: DeKort was replaced early in the proceedings by Alex Fotinos of Barrie, and the team had a chance to possibly win the division over the Sault Ste. Marie Greyhounds in the later part of the season. However, when Slater Koekkoek suffered yet another season-ending shoulder surgery, things went south in a hurry and they were no match for the Knights. 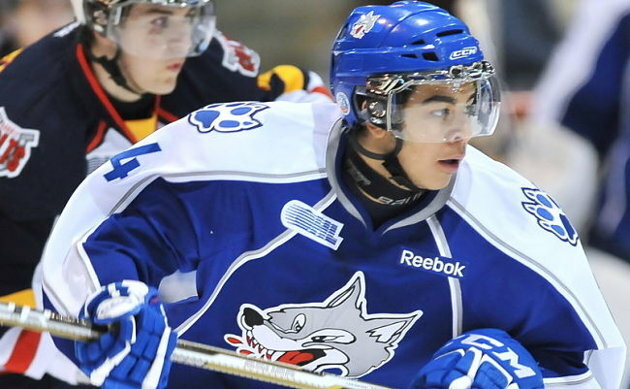 What Lies Ahead: Though they will lose Koekkoek, Ben Johnson, and Brady Vail, the Spitfires won’t fall too far off next season, especially with Joshua Ho-Sang leading the way and if they are able to land Montreal Canadiens draft pick and 2013 import draft pick Jacob De La Rose. 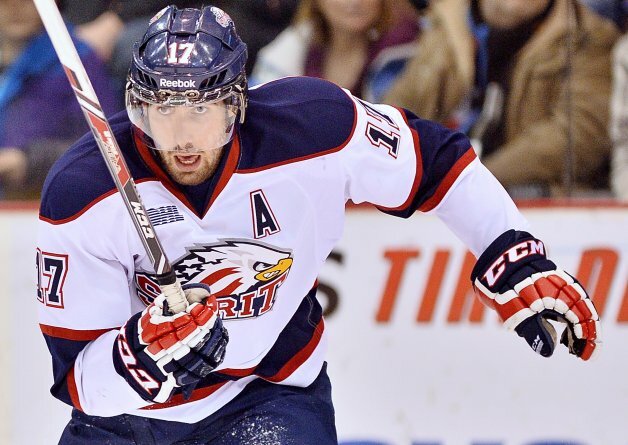 As ever, I expect the Spits to take a run at some college guys, namely defender Will Butcher and forward Nick Schmaltz. What I Predicted: For a team that’s only made the conference finals once in their franchise history (in 1993), it’s hard to imagine the Frontenacs actually jumping over that hurdle after years in the wilderness. But if everything goes right for them, a trip to the OHL finals might be in the cards. What Actually Happened: The Kingston Curse struck again big time, as the Frontenacs will go down as the fourth team in league history to blow a 3-0 series lead, and will also join the 2004/05 Sault Ste. Marie Greyhounds as the only clubs to lose the seventh and final game on home ice. They had many chances to wrap up the series, including an early 3-0 lead in Game Six, but they were unable to seal the deal. What Lies Ahead: On the one hand, most of the top players on the team should be back, with the biggest being leading scorer Sam Bennett. However, overage goalie Matt Mahalak will be leaving town, which means their will again be more questions marks in between the pipes, which could have been solved with bringing an import if they allowed it in the CHL (Again, thanks a lot David Branch.) Plus, given the collapse in the first round, it will be curious to see how the team will try and move on from what happened. Before we get to my second round predictions, let’s take a minute to discuss the legend that is David Ling, especially with what happened to the Frontenacs in the first round. 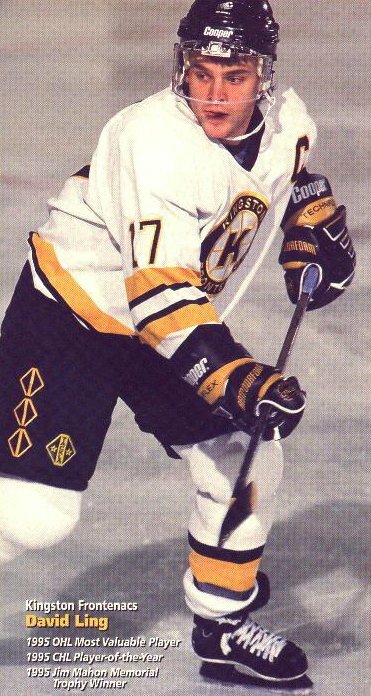 Back in the 1994/95 season, Ling went off big time with 135 points to finish second in league scoring (in a tie with Windsor’s Bill Bowler and four points behind Oshawa’s Marc Savard) and picked up the CHL Player of the Year award. He continued that scoring pace in the playoffs, with 15 points in just six games, despite playing with a broken thumb. But why only six games? Well, despite having a bye in the first round (only 14 teams made the playoffs back then), the team were knocked off in the quarter-finals by the Belleville Bulls, bringing an end to arguably the best squad the Frontenacs have ever had. Okay, I’ll be honest, I mainly did this just to delay my playoff picks for Round 2, as I am still debating who is going to win the two massive series in the Western Conference. I’m off to try and prepare myself for the two series I just talked about, so I’ll catch up with you all again for the semi-finals.